Even as a young child I would dream about the possibility of space. I would draw pictures of treehouses in my backyard and create my own dream room furnished with luxurious décor. At one point during art class, my elementary art teacher assigned us to recreate Fisher Elementary. I remember the excitement I had. The endless options to recreate at my fingertips to recreate my little school invigorated me. As I went into high school and began to seriously consider my career path I explore different fields of study such as graphic design and art history. But what really solidified my decision to major in architecture was my visit to Ball State University’s College of Architecture and Planning. It was there I saw what the students learned and did and I knew it was where I wanted to be. Receiving a scholarship from the Class of 1964 meant a lot to me. As many of you know college is expansive and working at a frozen yogurt shop making $7.50 an hour can only go so far. For me to raise the $1000 scholarship I received is the equivalent of working 134 hours. I am so privileged to come from such a great high school whose alumni raise enough money to give back to future Speedway graduates. Thank you so much Class of 1964! Judy Lennie – granddaughter, Alexa Faulkner is a pitcher for Speedway. Bob Maple – 7th & 8thgrade girls softball coach. Bob is occasionally helped by Pat Murphy and Glen Curtis. WEST LAFAYETTE – Speedway softball’s coach couldn’t help but laugh. This was her team’s first season with sectional and regional titles. This was her program’s first shot at a state title. This was her Sparkplugs’ shot at immortality. And they delivered in front of a throng of screaming fans at Purdue University’s Bittinger Stadium. 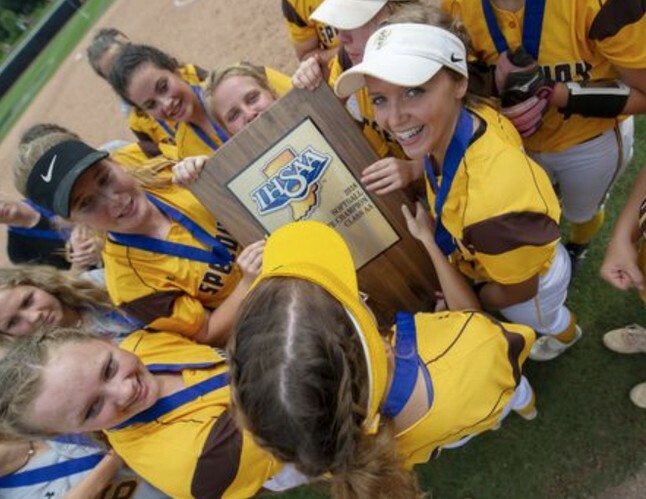 However much of the town that came saw their team defeat top-ranked Bremen, 5-0, for the IHSAA Class 2A state title. 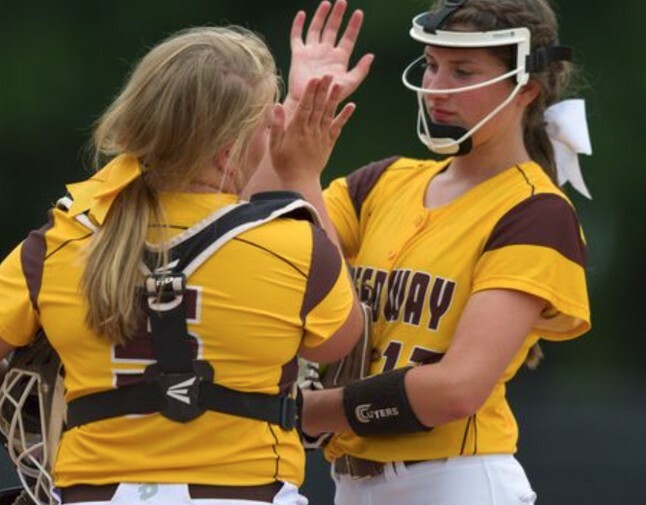 It was Speedway’s fourth straight shutout as the Sparkplugs haven’t allowed a run since beating Cardinal Ritter in sectional play. Freshman pitcher Kaiah Fenters built on what could already be considered a team MVP season to pitch a one-hit, seven-inning shutout. Fenters entered the game with 209 strikeouts and a 1.85 ERA, and added 10 more strikeouts to her total. The record for strikeouts in a Class 2A state final by a single pitcher is 14. Speedway (22-6-1) jumped out to a three-run lead in the bottom of the second inning. Small-ball strategy and Bremen (26-4) infielders’ misplays opened the door. The Sparkplugs’ victory, which gave the team a 13-game winning streak to finish the season, handed the Lions their stiffest defeat since mid-April. Speedway became just the second opponent this season to shut out Bremen, which averaged more than 10 runs a game this season. 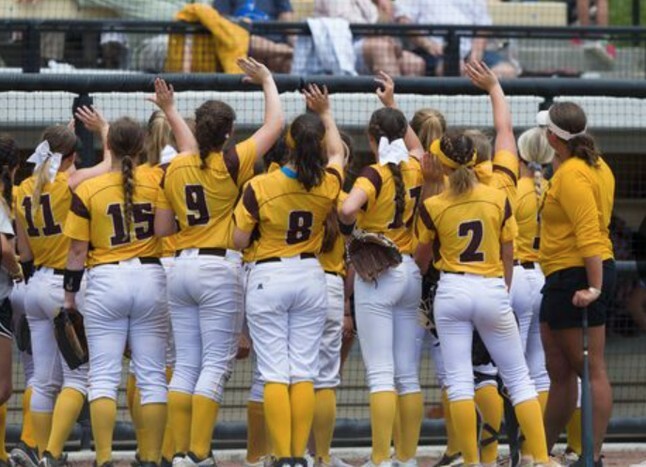 The Speedway High School team acknowledges their fans before the start of the 34th Annual IHSAA Softball State Finals class 2A game, Saturday, June 9, 2018, at Bittinger Stadium on the campus of Purdue University, West Lafayette. Speedway High School won the game 5-0, over Bremen High School. 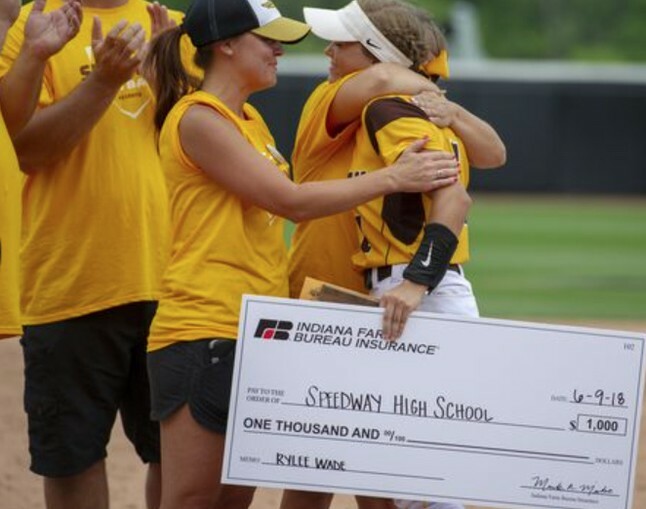 Speedway High School senior Rylee Wade (1) was announced the winner of the Mental Attitude Award after the 34th Annual IHSAA Softball State Finals class 2A game, Saturday, June 9, 2018, at Bittinger Stadium on the campus of Purdue University, West Lafayette. Speedway High School won the game 5-0, over Bremen High School. Speedway, our dear old Speedway, Oh, Speedway, we’re all for you! We will fight for the Brown and Gold And the glory of our dear school. Never daunted, we shall never falter; Through the battle, we’re tried and true. 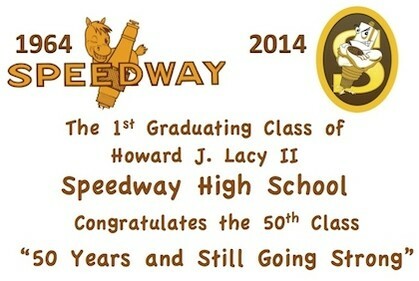 Oh, Speedway, our dear old Speedway, Oh, Speedway, we’re all for you! This is the 1/2 page paid Ad which will appear in the Class of 2014 Yearbook. Watch this video and get fired up about attending our 50th Class Reunion.